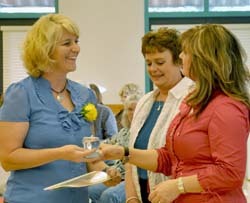 Teachers honoring teachers, that is what the Thompson Education Association Crystal Apple Awards are all about. 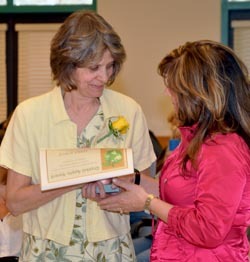 The award ceremony on Friday, April 22 honored Thompson School District teachers for excellence. 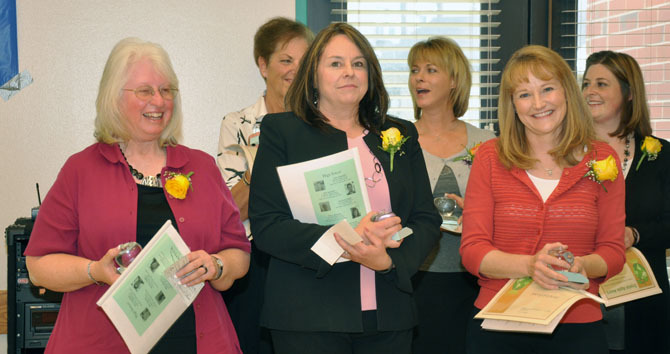 Twenty-three teachers were nominated for the Crystal Apple Awards which were presented to three educators, one elementary, one middle school and one high school teacher. Each nominee received a “Crystal Apple” memento of their nomination. 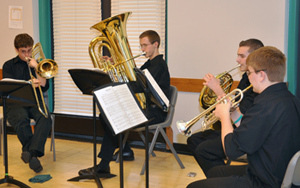 The apples are supplied by The Horace Mann Insurance Company which sponsors these awards. 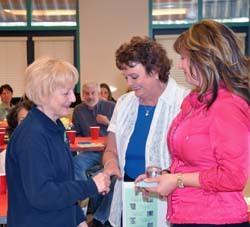 Local agent Susan Krantz and TEA president Lauri Shearer handed out the mementos of the occasion. The final awards, as chosen by the Crystal Apple Committee, includes a check for $250 and the recipients were admonished to spend it on themselves, not on classroom supplies. 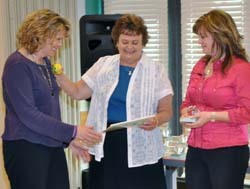 The recipients of the Crystal Apple Awards were; Jeanne Ann Steffans, Namaqua Elementary; Jaymie Cruickshank, Walt Clark Middle School and Ann Gonzales, Berthoud High School. Berthoud High School principal, Chris Garcia was quick to point out that in the ten years of the Crystal Apple Awards, five of the recipients have been from Berthoud High School. Site contents copyright © 2019 Recorder Online	except as noted. All rights reserved. | 96 queries in 2.151 seconds.